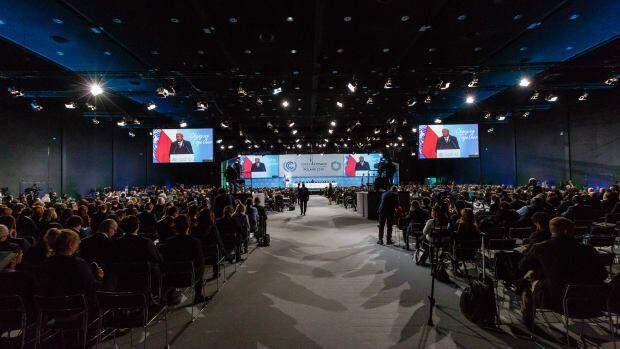 Leaders and negotiators from almost 200 nations listen to speeches during the opening of the COP24 summit on climate change in Katowice, Poland, on December 3rd, 2018. 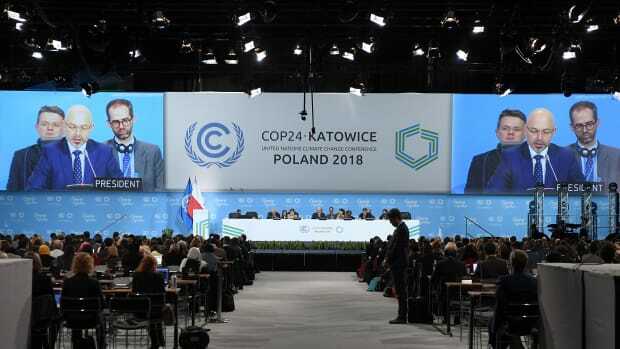 In the years leading up to and following the Paris Agreement, climate finance increased by 17 percent—a finding from a new United Nations report that could ease the U.N. negotiations on climate change currently taking place in Katowice, Poland. The question of money—who&apos;s providing it, who&apos;s promised it, how much there is—is always controversial at these talks, and the success of other discussions often depends on whether developing countries feel they can trust developed countries to deliver this much-needed cash. Without it, poor nations will struggle to meet their commitments and adapt to the effects of climate change. 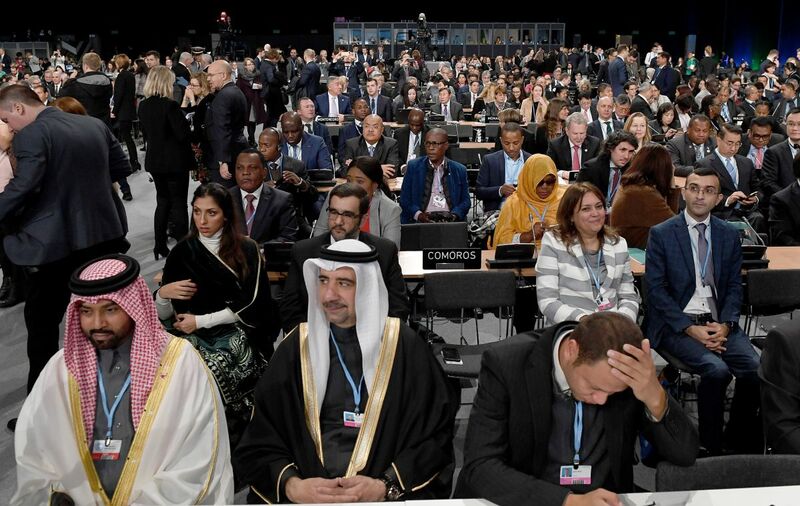 As such, the U.N.&apos;s biennial effort to summarize the state of global climate finance inevitably draws keen scrutiny, with the potential to both smooth and complicate the proceedings. The 2018 edition of this document is particularly significant, as it is the first snapshot that the U.N. has of whether and how the Paris Agreement has affected climate finance. According to the report, climate finance flows increased from $584 billion in 2014 to $681 billion in 2016. This number covers everything from private investments to domestic spending to grants that flow to the developing world. By far the largest slice of this $681 billion pie is global investment in renewable energy, at $295 billion, the majority of which consists of private investment. Energy efficiency came in second, where annual spending in 2015–16 totaled $246 billion. 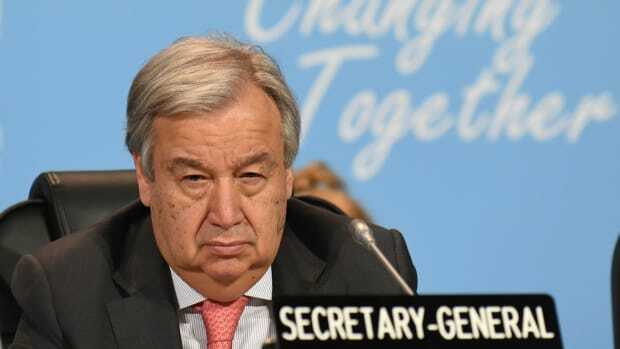 Perhaps more politically significant is the money flowing from the public purse, which can be handed out to specific countries or through multilateral climate funds, such as the U.N.-backed Green Climate Fund. These public monies came to $55.7 billion over 2015–16, an increase of 30 percent over 2014 levels. In turn, that $55.7 billion helped mobilize around another $20 billion in private finance (although estimates on the latter number are vague). This increase in public funding, and the private funding that it mobilized, is significant, because these are the sums that will contribute to the $100 billion that developed countries have promised to provide every year from 2020. Since U.N. nations agreed to this goal in Copenhagen in 2009, recipient countries have been seeking assurances that donors are on track to scale up financial flows to this level by the deadline. The latest U.N. climate finance report suggests that the world might finally have that assurance, according to Joe Thwaites, who works on climate finance at the World Resources Institute. "If this rate of increase continues, then developed countries are on track," he says. Climate finance reports haven&apos;t always been welcomed. The mammoth task of assessing these global flows is, by its nature, an inexact science, relying on aggregations of numbers from various external organizations, and on self-reported data from governments relying on different methodologies. In particular, several major developing economies—including China, Brazil, South Africa, and India—rejected the findings of a report released in 2015 by the Organization for Economic Cooperation and Development, which claimed that developed nations had already mobilized $57 billion in climate aid in 2013–14. These powerful nations complained that they had been excluded from the assessment process, and that they did not recognize the numbers in the report. The U.N.&apos;s own attempt at amassing these numbers hasn&apos;t exactly been welcomed by all countries, but neither has it been rejected, says Seyfi Nafo, a Malian negotiator who co-facilitated the assessment. "We went from bashing to being a bit silent, so we hope it&apos;ll be really welcomed by 2020. That will be the fourth edition—there&apos;ll be a lot more data from the receiving side, so by then it&apos;s going to be a fuller, more complete picture. Hopefully by then it&apos;ll be welcome by all," Nafo says. "In this process, silence is OK."
Despite the report&apos;s overall positive message, there are still some serious concerns about the state of climate finance—and it should be noted that not all countries have been entirely heartened by the new report. On the same day it was launched, India&apos;s Ministry of Finance released a report criticizing the U.N.&apos;s assessment, saying that "crucial gaps" in its methodologies made "meaningful comparisons difficult." Another concern is that the report only covers the years 2015–16. With the rise of populist and conservative governments since then, there is understandable anxiety that climate change funds could have subsequently decreased. In 2017, for example, President Donald Trump announced that the U.S. would no longer contribute to the Green Climate Fund (although Congress has continued to fund other international climate initiatives). Australia has also said it will not give any new money to the fund. 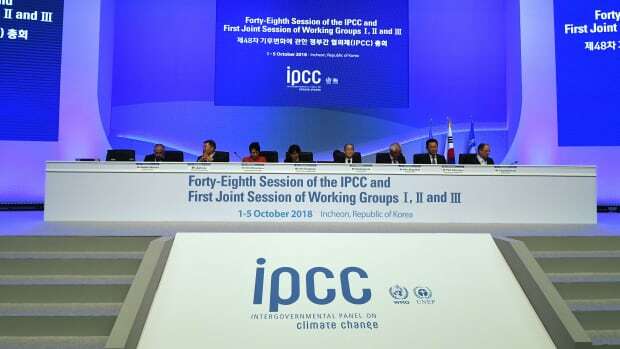 The U.N. report also expressed concern that financing for adaptation projects has continued to receive short shrift, receiving less than 30 percent of all international public climate finance. Without these resources, poor countries will be less able to protect themselves from the effects of climate change, but since there&apos;s less of a business case for these kinds of projects, the money can be harder to raise. 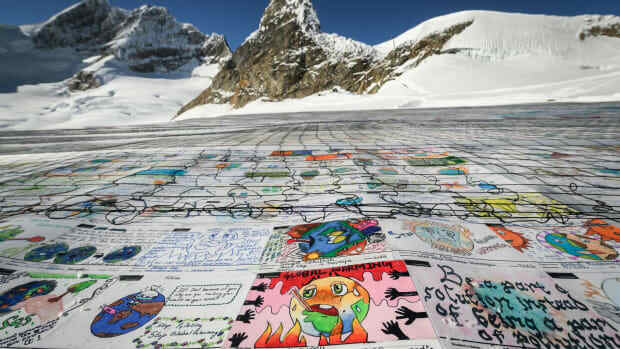 The real obstacle, however, is the hundreds of billions of dollars that governments and businesses are investing in projects that actively undermine efforts to tackle climate change, as well as the trillions of dollars at risk from climate impacts. In 2016, according to the report, $742 billion was invested in fossil fuels, and $373 billion spent on fossil fuel subsidies. Meanwhile, by 2050, the world faces up to $20 trillion in stranded assets—assets that have unexpectedly lost their value—the report says. "Simply focusing on climate finance flows misses the bigger picture—that while a small portion of finance goes to climate change, the rest is invested in ways that often run contrary to low-carbon pathways and the Paris Agreement itself," says Patricia Espinosa, executive secretary of the U.N.&apos;s climate body. "It&apos;s like taking one step forward and two steps back. Nobody&apos;s suggesting that all finance flows must have explicit beneficial climate outcomes, but they should not be working against us. They should not run contrary to what countries agreed to." 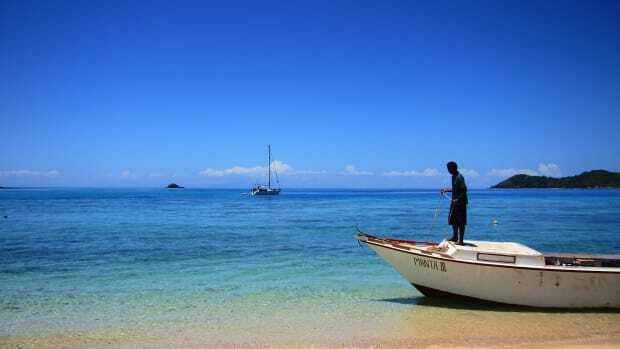 A look at Fiji's emissions offers insights into why different countries tussle over what to do with climate cash.